Private, Quiet and Relaxing Beachfront Condo located on the 'WORLDS MOST FAMOUS BEACH'. condo sleeps six comfortably. It has a spacious living area and a generously equipped kitchen. casual comfort that you would expect. you with the maximum amount of conveniences and comforts that you would expect during your stay. Lovely condo - very comfortable! The condo was well appointed and very comfortable for the two of us. We cooked several nights and the condo provided the items we needed to do so. The front desk people were helpful and it was comforting to have them there; and Jim, the owner, was very responsive to our questions and addressed our one issue swiftly. The location was great - grocery store, drug store, Starbucks, restaurants and, of course, easy access to Crabby Joe's. We really enjoyed walking the beach and visiting (several times) the Ponce Island Jetty, beach, and Marine Science Center Walking path. We saw lots of seabirds and dolphins from our veranda - with and without binoculars. Only one note for star gazers: the night lights from Crabby's and from the pool limit the view of the stars. Highly recommend!! Beautiful and clean beach front condo stocked with all the amenities!! This rental was exactly what our family was looking for!! Right on the beach and very clean with plenty of space for the 4 of us. Everything from check in to check out was easy and as described on vrbo. The front desk lady was incredibly sweet and helpful. We enjoyed our stay and I would highly recommend this rental to others. Our family of five had a great vacation! The condo was perfect! We will definitely be back! Thank you! Very comfortable condo. Clean and well maintained. Definitely a place that you never want to leave! Unit #502 is a beautiful condo! The minute you walk through the door, you feel at home. The condo was very clean and the decorations were perfect with the beach and ocean theme. The view from the condo is the best! I sat on the balcony for hours watching the beach traffic and listening the the ocean! Relaxation at its finest. The price was very reasonable also. 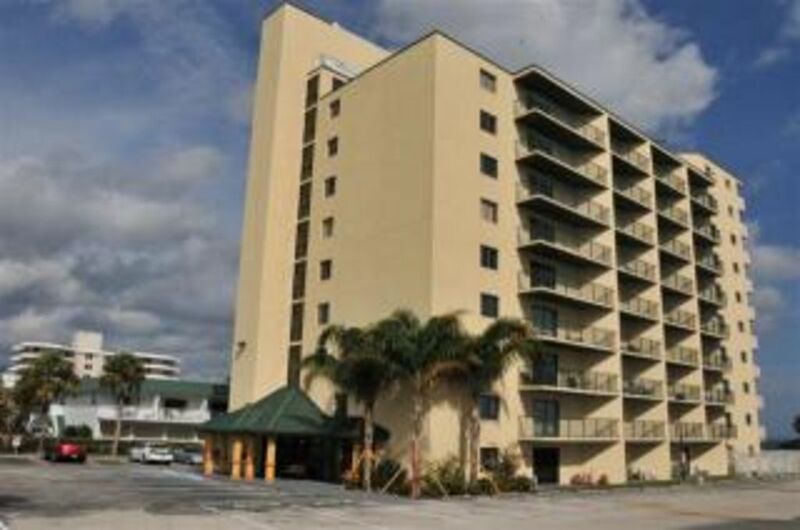 I look forward to my next visit to Daytona Beach and another stay at the Sunglow Resort! We had a wonderful fall vacation last week at the Sunglow Resort. Our unit was very nice, clean and well stocked with all the necessities for a very comfortable vacation. The decor was very cheerful and beachy. We spent most of our time on the ocean front balcony and loved watching all the activity on the beach and the Sunglow Pier. Crabby Joe’s Restaurant on the pier was so good and offered breakfast lunch and dinner and even hand dipped ice cream for an evening treat. The staff at the front desk was very polite and helpful with any questions we had. But, mostly, the owners were amazing to work with and went above and beyond to accommodate our needs. We will definitely come back whenever we get the opportunity to stay at Sunglow. a charcoal grill for you to enjoy. beach, fish on the pier or eat at Crabby Joes while enjoying the ocean atmosphere. Daily, Weekly, and Monthly Rates Are Available for Your Stay: $105 - $125 per night with 3 night minimum (excluding Holiday and special events) $625 - $775 per week (excluding holidays and special events) Add $75 departure cleaning/towel service and 12.5% sales/tourist tax to all rates. Advanced deposit of $200 is required to hold your reservation.